1 February 1935: Inspector with the Fortress Inspectorate VI. 1 September 1939: On Construction Staff 14. 6 February 1940: General of Pioneers, Army Group C.
25 October 1940: General of Pioneers, Army Group D in France. 15 January 1943: Commandant of Fortifications in Eifel-Saarpfalz. 19 May 1943: Transferred to Army Group Centre in Russia. 13 October 1944-15 October 1944: Delegated with position as General of Pioneers, Army Group Centre. NOTE: Schimpf’s World War II decorations, if any, are not known. However, he was not a recipient of any high decorations such as the Knight's Cross of the Iron Cross, Knight’s Cross of the War Merit Cross with Swords, or the German Cross in Gold/Silver. 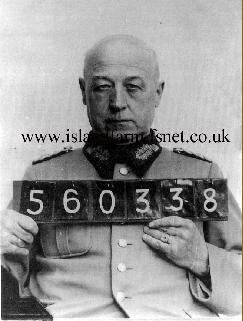 Click here to see photos of Generalleutnant Oskar Shimpf in the company of fellow prisoners of war at Island Farm.